It’s a time of great change behind the scenes here at ‘The Human, Earth Project’, and I’m excited to share some really big news with you today. Six months ago, I called for volunteers to help me promote the project. That call was answered by Melissa Adams, Katie Carriero, and Astrid Hofer. Since becoming involved with the project, Mel, Katie, and Astrid’s contributions have gone far beyond mere promotion: they have become an integral part of the project. Mel is building our new website, Katie is involved in research, fundraising, and partnerships, and Astrid is now working with Claire Harris on the ‘Sisters For Sale’ podcast. One of the exciting things about Mel’s new website is an ‘Our Team’ page, where we’re finally able to give the people behind the project the recognition they deserve – not only Mel, Katie, and Astrid, but Claire, Myste, and Yuqing, and everyone else who has been involved with the project. Mel did a great job building that page – but when I first saw it, something about it struck me as very wrong. There was a large picture of myself at the top of the page, with smaller images of six women beneath me. It struck me as the wrong way to structure any organisation, and particularly one with such an emphasis on women’s rights. I realised it was time to change – not just the page, but the entire project. I don’t need or want to run ‘The Human, Earth Project’ as a traditional hierarchy. I’m working with a group of intelligent, highly capable women who are skilled in many ways that I am not, and there’s absolutely no reason for me to be their “boss”. Yes, I founded ‘The Human, Earth Project’ and have been at its core since the beginning, but this project is not about my ego. It’s about human rights – particularly, women’s rights – and I would love to see it led by women. The most important thing for me is not where the project came from, but where it’s going. It’s not a matter of my stepping down: it’s a matter of Mel, Katie, and Astrid stepping up, so that they can take more power within the project, and we can all make major decisions together on an equal footing. For 5.5 years, ‘The Human, Earth Project’ has been a tiny, grassroots organisation. This is our first major step towards becoming a larger, more durable organisation, so we can make the biggest possible impact in raising awareness of the global human trafficking crisis. The next step will be organising sufficient funding to transition to paid roles, so that we can give this work the time and energy it deserves. It’s an exciting time for the project, and I’m looking forward to seeing where this next leg of the journey leads us! Almost everyone involved with ‘The Human, Earth Project’ began as a friend or supporter. Many people – including Mel, Katie, and Astrid – first became involved for a specific task, and their roles have grown naturally according to their own talents and passion. Jeppe Hildebrandt, for example, came onboard as a film colorist, and became a key figure in the post production of our ‘Sisters For Sale’ documentary. Myste Laquinta is a supporter and contributor who was of immeasureable assistance during previous fundraising campaigns, and will soon be taking an ongoing role with the team. Yuqing Zhang first assisted with smaller tasks behind the scenes, and went on to single-handedly assemble and organise a team of 16 translators to produce a full Chinese translation of our documentary. From humble beginnings, ‘The Human, Earth Project’ has become something each of us has found our own purpose and meaning in, something we can all be proud of. If you’d like to be part of our growing team, please get in touch – you never know where it might lead you, and what a difference you will make. 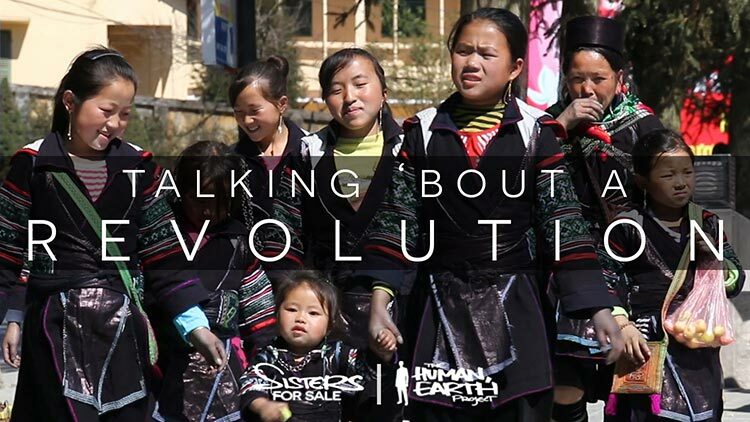 Over the past two months, we’ve had an amazing team of people translating our ‘Sisters For Sale’ documentary into the Hmong language, which is now complete. I’d like to give a huge thank-you to Kathee Her, Mai Hernandez, Shoua Herr, May Ceceil Lee, Shillbe Lor, Nouchee Dawn Moua, Youa Xiong, Pa Dao Vang, Tria Vang, May Na Vang-Curtis, PaNhia Vue, Youa Xiong, Choua Yang, and See Yang. There are now seven versions of the film soon to be released – Chinese, English, French, German, Hmong, Spanish and Vietnamese. The Hmong translation is an especially important one, with Hmong people and Hmong culture at the centre of the story, and it will be amazing to be able to share the documentary with Hmong communities around the world. Working with our various translation teams over the past ten months has taught me a great deal about translation. It’s like painting a picture, or singing a song – anyone can do it, really, but to do it properly takes great care and talent. Translating ‘Sisters For Sale’ has involved its own particular challenges, with so many of our interviewees speaking English as a second language. I’m deeply grateful to all of our translators who have poured so much love into making ‘Sisters For Sale’ available in their own languages, and especially to our supervising translators – Elisabeth De Sa Barbaro, Astrid Hofer, Laura Rodríguez Jarillo, Tria Vang, and Yuqing Zhang. Thank you so much! I look forward to sharing our new website, and the Hmong trailer for our documentary, with you soon – stay tuned! Don’t miss the news on ‘Sisters For Sale’ and ‘The Human, Earth Project’ – subscribe here!